Houston, the most populous city in Texas, has a population of more than 2.3 million people, 49.3% of whom are non-English speakers, and Mandarin Chinese is the third most common non-English language spoken there, after Spanish and Vietnamese. The Education Division of the Taipei Economic and Cultural Office (TECO) in Houston recognized the communication challenge that this can present for police officers there and worked with the Houston Police Department (HPD) to set up a 20-week Survival Mandarin program for its officers. The initial training program began in March 2018 with 25 HPD officers participating, and despite the at times unpredictable nature of police officers’ work schedules, sixteen successfully completed it. The new training program also enhanced positive interactions between HPD and the Chinese speaking community in Houston. 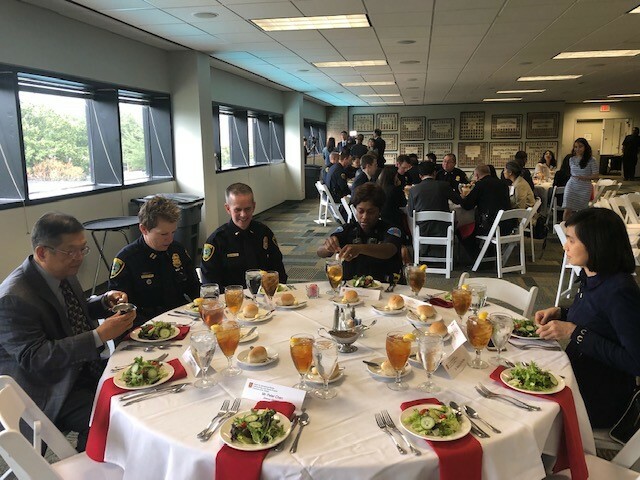 A celebration luncheon and certificate presentation was held at the University of St. Thomas on December 12, to congratulate them on their achievement and encourage more officers to take the training next year. Houston Police Chief Art Acevedo addressed the luncheon and mentioned that it was the 50th anniversary of his family’s arrival in the United States as political refugees from Communist Cuba. The best gift that his family has is freedom, and as such, he has much appreciation for the democracy that Taiwan has, and he truly values the partnership between Taiwan’s Ministry of Education and HPD. HPD and Chief Acevedo both recognized the 16 officers who completed HPD’s first ever Mandarin language training class and the cooperative relationship with TECO in Houston that brought it about, on their Twitter accounts after the luncheon. At the end of each Survival Mandarin training program, one to three officers who have made the most progress in learning Mandarin Chinese will have an opportunity to undertake a short-term language immersion experience in Taiwan. The six finalists demonstrated their Mandarin speaking skills during the Certificate Presentation. The winners will be jointly selected from among the six finalists by the class teacher, HPD, and Taiwan’s Ministry of Education. PHOTO: Everyone enjoying a celebration luncheon after the certificate presentation.